Founded by Kunihiro Ishiguro and Yoshinari Yoshikawa the founders of GNU Zebra, came together to form IP Infusion back in 1999 as a commercial-grade, hardware-independent networking software company. If you’re not familiar with Zebra, you probably know it’s little brother Quagga which powers everything from Cumulus Linux to Vyatta and even my old digs.. Imagestream routers. Ishiguro and Yoshikawa took Zebra, and built ZebOS, which has been working behind the scenes in products we all use every day for years. IP Infusion’s ZebOS powers everything from F5 LTM’s and Citrix Netscaler’s to Plexxi, SK Telecom, and Huawei networking products. 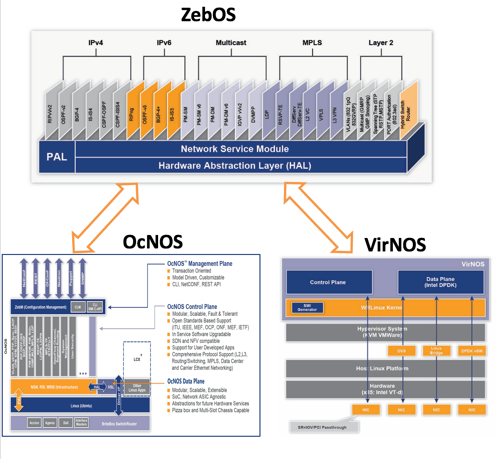 Today IP Infusion is selling two variants of ZebOS to OEMs, OcNOS and VirNOS. OcNOS is a full featured network OS built specifically for White Box OEMs looking for switching, routing, MPLS, and SDN support. It can support a hybrid, centralized, or distributed network framework which provides a scalable, modular, and robust framework that can be deployed on merchant silicon. VirNOS is their NFV solution that can be used for distributed or cloud based vCPE, vPE, or vRouters in your data center. Whitebox networking is a really exciting market that I have been looking into since the SDN craze started. With OcNOS being widely supported on the Trident II / II+, Helix4, and Tomahawk SoC’s there is no shortage of support for running a thoroughly vetted NOS on your whitebox COTS hardware. Here are a couple NFD delegates that also wrote on this subject. Who is IP Infusion and Why Have You Never Heard of Them? Network engineer turned management currently servicing the enterprise data center market. I started working on networks in the ’90s and still feel like that was just a few years ago. Jack of all trades, master of none; I love to learn about everything. Feel free to ask me about photography, woodworking, nhra, watches, or even networking! — For feedback, please leave a comment on the article in question, and I’ll respond as soon as I can. For everything else including fan mail or death threats, contact me via twitter. Mandatory Cisco DNA Licensing – is this the Future?? AIOps the next big thing for Enterprise IT?